In this Episode Didier and Carsten do not show great technology instead the talk about their year 2014. They share their highlights as speaker, talk about great events, the last MVP Summit in Redmond and even share some insights (like how Carsten broke his nose). In this show Didier and Carsten talk about features in Storage Spaces. Carsten demonstrate how to get statistics from the Autotiering process, how a Scale-out Fileserver reacts on a catastrophe (power loos) and shows what happens when he turn of an actively used JBOD in a Enclosureaware three JBOD setup. Have fun watching this Showcast. P.S. : Here are the links to the mentioned Autotiering.ps1 script and the explaining blog post (in German). 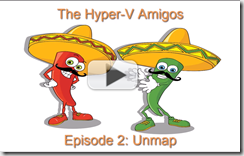 This Episode of the Hyper-V Amigo Showcast could easily be named “The ORIGINAL Hyper-V Amigos”. Why is that? Because this time Didier and I are joined by Adain Finn (@joe_elway) and Hans Vredevoort (@hvredevoort). 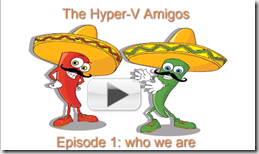 We four are the “original Hyper-V Amigos”. Of course we tell the story behind that. Aidan, Hans and Didier were so happy to attend TechEd 2014 North America. We talk about that as well and every one of them tells their favorite thing from TechEd 2014 NA. I wish you much fun when you watch this Video because we had quite a bit !